Lush green grass springing up all around us heralds the arrival of spring. Time to get crafting for Easter! With this in mind, we’ve put together a collection of creative ideas to help you paint colourful Easter eggs, decorate your home in an Easter theme and craft your own seasonal gifts. Some of these projects are quite easy, so children can also join in the fun. The edding product range includes porcelain brush pens, paint markers and chalk markers to help you make this Easter really special. In the Netherlands, it is traditional on special occasions to draw beautiful decorations on window panes. This idea has now spread to other countries, which is why we have conjured up this “eggcellent” Easter window design using edding chalk markers. Window chalk is very practical as it’s easy to remove with a damp cloth. So if you make a mistake or you want to replace an existing motif with a new one, no problem – simply wipe it off and start afresh. edding chalk markers are filled with liquid chalk, specially formulated for use on smooth, glossy surfaces such as glass and mirrors. There are ten opaque colours in two stroke widths to choose from, including white and a selection of four neon shades. These adorable Easter mugs are sure to raise a smile at breakfast time. The design is very simple to apply, yet looks surprisingly effective. Using edding porcelain brush pens, draw a bunny face on the underside of the mug, with the long ears extending up the outside of the mug. When the mug is tilted in order to drink, the whole face suddenly becomes visible. Spring a surprise on your family with these hilarious mugs and even the biggest of sleepyheads will be tempted to the breakfast table to join in the fun! There are 15 vibrant shades to choose from, and the designs can even be made dishwasher-safe by simply baking the mugs afterwards in a pre-heated oven. Easter surprises aren’t just for children – let’s not forget that we adults also love receiving colourful chocolate eggs and other little treats, especially when they’re lovingly packaged. 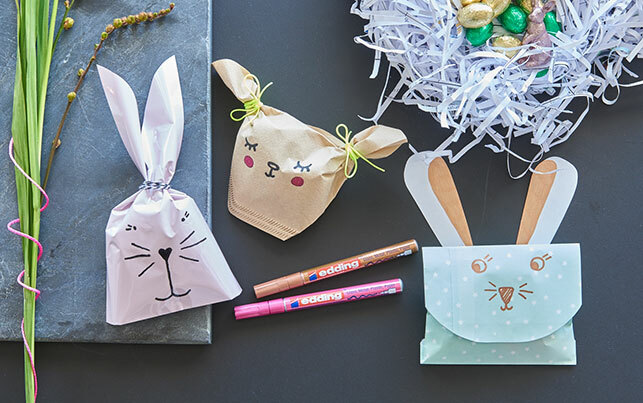 We made these amusing treat bags from ordinary materials you can find around the home, so they’re ideal for those last-minute gifts. To draw a cute bunny face, all you need is some plain paper bags (or you can use coffee filter papers) and edding gloss paint markers. To finish, close the gift bag by tying a pretty ribbon to create the ears.